Non Violent Communication and Mediation in Kenya - Netzwerk Gewaltfreie Kommunikation Darmstadt-Südhessen e. V.
D-A-CH Verein deutsch sprechender Gruppen für Gewaltfreie Kommunikation, GFK e.V. 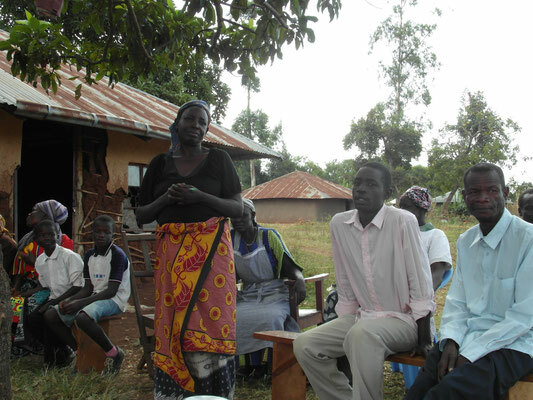 Trained mediators are concentrating on conflict resolution and prevention. Actual project owner is the a.m.network as well as local groups and organisations e.g. Peace Ambassadors Kenya, PAK and Amanasie in different places in Kenya. Since its independence from England several different ethnicities are in continuous conflict that every now and then flares up in violent actions. Scarcity of food, and monopolies in politics, as well as persistent prejudice build up from early childhood against other ethnic groups and together with a lack of communication contribute to the escalation of the conflicts. It is about food, land, cattle but also about manipulation of elections, liberty of opinion and freedom of speech, or simply the belonging to a different ethnic group. A central problem that many conflicts in Kenya share is the deficiency of respect and appreciation the different ethnic groups have towards each other. This means that other ethnic groups may be considered worthless or even bad. There seldom is adequate jurisdiction or law-enforcement when land or cattle is taken away. The former owners may be driven away or even killed. The NVC approach aims at mutual respect and appreciation. In seminars the participants learn techniques to moderate the risk of escalation between the ethnic goups. Important is the encounter of representatives of different ethnics giving them the opportunity to really get to know each other. Together with the neutral mediators ”of Non-violent communication and mediation in Kenya” former conflicts are worked on with NVC- methods. 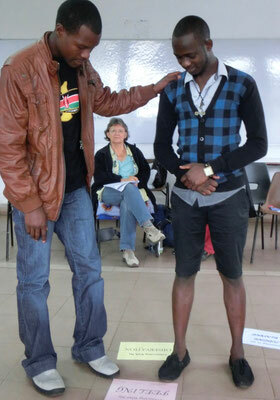 The participants are coached to formulate what happened in an objective and nonjudgemental way. The second step is to say what they have felt during the experience. The next step is to find out which needs were not fulfilled by what was happening. Consequently the participants cooperate on how this needs can be fulfilled in the future in a life enriching way. Finally the conflict participants formulate wishes and requests themselves and to the other party in order to prevent conflicts or to minimise mutual prejudice. In most times the participants find out that both parties have the same or similar needs which they want to fulfil. For instance there is the need for food in order to avoid hunger, the need for safety, or the need for autonomy. Based on this the participants develop a connection among each other. Enemy-Images and prejudice do not prove true in the close exchange of inner feelings and needs. By repeating the seminars on a yearly basis the NVC-mediators ensure that the experienced mutual understanding is available for the practical reconciliation over a longer period. After about three years all participants are able to practice reconciliation and to transfer the developed techniques to other members of their ethnicity. Quality assurance is done through interviews and questionnaires.